The Finest in Analog Sounds. 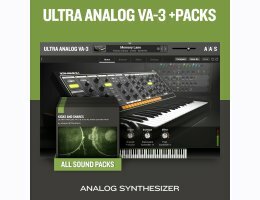 In a world filled with reproductions and ever increasing complexity, Ultra Analog imposes itself as a unique and powerful synth that is fast, easy and remarkably versatile. At the heart of Ultra Analog are the best alias free oscillators of the industry, featuring standard wave shapes, hard sync, sub oscillators and integrated pitch envelopes for the most impressive evolving and dynamic analog tone you ever heard. Two audacious multimode filters with distortion are then applied to confer Ultra Analog its sonic character. Finally, carefully chosen modulation options are provided by two syncable comprehensive LFOs, four loopable velocity sensitive ADSR envelopes generators and vibrato. Whether you are into techno, urban, trance, electro, trip-hop, or any other musical style, the Analog Essentials sound bank offers a great selection of arpegios, basses, pads, percussion, synths, and sound effects that will perfectly complement your next production. There are 148 presets in the Analog Essentials library. There are 128 presets included in Ultra FX for you to explore. Starlight lands with sounds collected at the confine of the galaxy. Indeed, the 149 presets scattered across ambient, arpeggiator, arpeggiator bass, chime, effect, keys, lead, rhythm, and synthesizer categories breach into the outer space for an impregnable intergalactic landscape. The 100 presets of 30.8676Hz flirt with the limits of your auditory abilities. Split in two, the Movements presets make heavy use of the arpeggiator for some ferocious thumping action while the Stills presets get you your dose of fat, snoring, and wobbly analog goodness. Highly inspired by the work of Vangelis and Jean-Michel Jarre, Angelicals is a retro-futuristic flashback in progressive and experimental electronic music. The 101 presets, divided into Arpeggios, Bass, Effects, Leads, Loops, Pads, and Synth categories, provide everything you need to dive right into the dramatic tension and enigmatic realms of sci-fi and thriller sounds. Inspired by his work in a wide array of genres over the last 12 years, Deadbeat's Sounds from BLKRTZ is a collection of 100 presets for Ultra Analog VA-1 which truly push the instruments to its earth shaking low and shimmering high extremes. It will come as no surprise to those familiar to his unmistakable dubwise style that subs and bass play a central role here, but you'll also find an inspiring array of evolving chords and stabs, ambient clouds, and slowly evolving sequences. The 127 presets of Plastic Pop muse back at arpeggio, bass, effects, lead, and pad sounds of the 80s. Included are analog and digital favorites from the Juno, DX7, Wavestation, and D-50 as well as guitar synths, the TX81Z's LatelyBass, and of course the Honkytonk sound! A superb kit to revisit the top new wave and synthpop albums from Duran Duran, Japan, Frankie Goes to Hollywood, and ABC. Shoulder pads are not included. Reverence is an ode to modern and vintage analog synths. Sean Divine's goal was to create sounds with the warmth, imperfections, and character associated with these instruments. His combined background and expertise as a composer, producer, and mix engineer results in a preset collection that is both truly inspired and tailored for production. The 115 sounds are divided into seven categories: Arpeggiator, Bass, Keys, Leads, Pads, Plucked, and Sfx. These finely crafted sounds include super precise percussion hits, unusual basses, thick pads, deep and animated arpeggiator loops, rich intricate ambient textures, and more. This collection of exclusive sounds once again showcase beautifully Richard Devine’s mastery of sound design and are sure to provide many hours of exploration in evocative soundscapes. Transparency is sound designer Daniel Stawczyk’s fourth title in our Sound Bank Series and his third for Ultra Analog VA-2. The 149 rich presets explore the percussive nature of our analog synthesizer. Kick, Snare, Hi-hat, and Percussion loops are bundled along with some finely crafted Ambient, Synth, and Effect sounds. Sean Divine drops its second installment in the Sound Bank Series in the form of a 114-preset collection that packs essential super low bass sounds, fast and punchy kick drums, catchy sine whistles to super phat saw synth leads, haunting and melodic plucks and bells, futuristic and furious arpeggios, emotionally charged vintage organs and keys as well as a selection of useful vinyl scratches and effects. Whether you’re into urban, trap, or hip hop, Low End Theory is serious core material that will steadily inspire your future beats. Pivotal pours a dose of high octane tones into Ultra Analog VA-2. The library presents focused, upfront, and mood altering sounds that will prove as addictive as any good stimulant. The 158 presets cover arpeggios, basses, leads, synths, and effects. "Daniel Stawczyk certainly sent us a ton of high energy shots with Pivotal. From the first few notes, we perked up and straighten our backs," said Eric Thibeault, product designer at Applied Acoustics Systems, "Adding up to 158 presets, this hefty collection presents focused, keen, and stimulating sounds that will definitely be the starting point of new ideas." Technocracy is a sound bank for the Ultra Analog VA-2 synthesizer and AAS Player plug-ins in collaboration with AAS newcomer, sound designer Adam Pietruszko.